Game Review by Imani Scott. Photo by Google Images. MAY 1, 2018: This fifth installment of the Elder Scrolls series has always quenched my mythical fantasies of burning enemies alive until my Magicka drains, mashing people with warhammers and sucking up dragon souls and spells to a beautiful soundtrack. 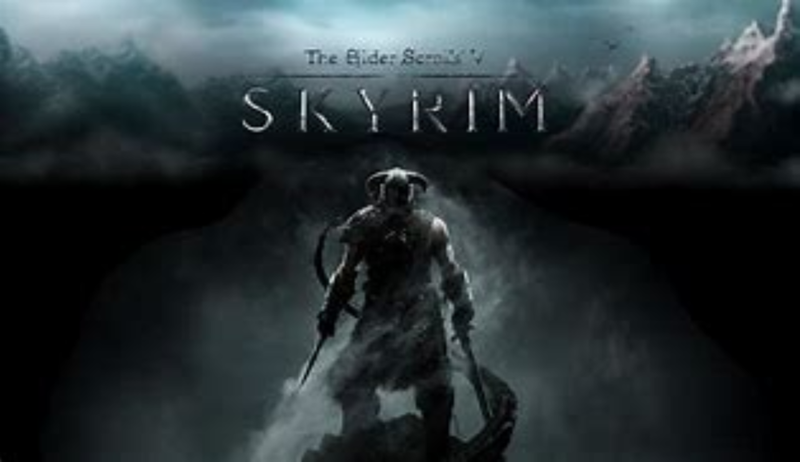 Released by Bethesda Game Studios in 2011 (Skyrim can now be bought on Amazon for 25 dollars if you want the basic version). Skyrim has been more than just a popular video game. The game is known for being a huge phenomenon that has affected the format and standards of RPG (role-playing games) and open world games forever. The series also gained a huge fan base that is very (if not equally) as creative and talented as the game’s creators. Devoted fans from around the world spend lots of time and energy creating endless amounts of mods to make the game more random, realistic, funnier or, in some cases, sexier. I personally love Skyrim just like any other seasoned gamer. The first Xbox was my first gaming system (thanks dad) but as amazing as it is to me, it does have its own flaws. Before I name the flaws, I admit I caught on to the bandwagon of elder scrolls exactly 3 years late; my taste in gaming wasn’t that high as a kid and I played literally anything that anyone bought me. Plus, I had a phase in middle school where I was trying to fit in with the feminine girl crowd. So I avoided video games to satisfy people’s unrealistic standards. Now that I’ve given that personal briefing, let me explain that my gripe with Skyrim is that one of the main reasons it aged so well was because of the modding community. I’ll give you, the reader, a second to cuss me out as you read that. Now that you’re done, the fans of Skyrim are what kept the game alive and running well for so long. People literally do mod reviews for Skyrim. I give Bethesda credit for making the high, well-fertilized foundation of the game, but the modders are who keeps the game alive with new FREE graphics, new clothing, weapons, interactions, NPCs and so much more. This is why if you tell a gamer that you play Skyrim on console (which now has a modding option that’s very limited compared to PC) that person looks at you with a strange face. Modding Skyrim makes the game itself so much more entertaining. Another big gripe I have with Bethesda is that it made a separate modding platform that has prices. You read it right, prices. Are you serious Bethesda? That is a closed fist hit in the faces of all the people who keep your game alive. That is an enormous insult to our intelligence, thinking that we would pay out of our pocket for those basic modifications that we could easily get on the internet for no dollars at all. Shame on you Bethesda, shame, shame, so much shame. Why are you making the Dovahkiin's angry? In conclusion, therefore, furthermore, and lastly, I would like to say that I am very disappointed with you, Bethesda. The only way you *sniffle* could fix this is if you could make an Elder Scrolls 6, maybe? Maybe let me do the voice acting on one of your main characters? Maybe introduce a new character creation system that is similar to the Sims 4? A map bigger than the last one would be nice. Not even an Elsweyr DLC? No, nothing? I’ll probably have to wait until the 2030s, if we’re even alive by then? Ok, I tried. Of course, I would recommend becoming a fanboy/girl of the Elder Scrolls series and even though there is a boil on the body of this beast, that doesn’t mean it can’t fight well. Imani Scott is a senior at Friendship Collegiate Academy.